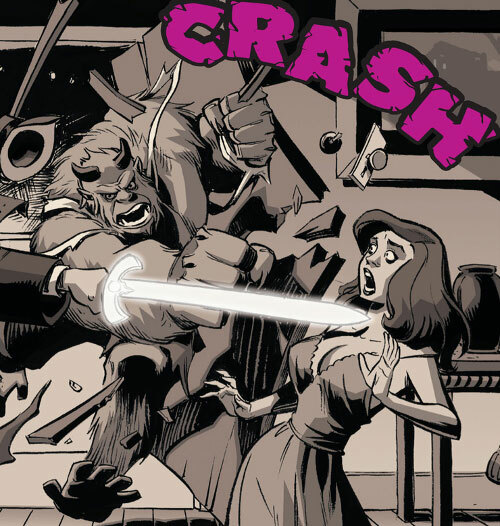 For the necessary context about the Fables setting, see our Fabletown article. Known Relatives: Beauty (wife), Bliss (daughter). 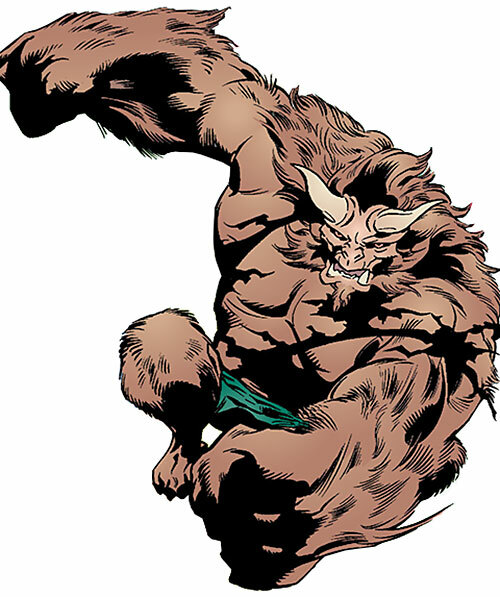 Beast’s normal form is that of a hairy, horned beast. He was changed by magic into a normal human, but the enchantment was linked to Beauty’s love for him. So if she became angry with him, the enchantment would fade, and he’d revert to his original form. This enchantment has recently been changed, so that he can change at will between the two forms. 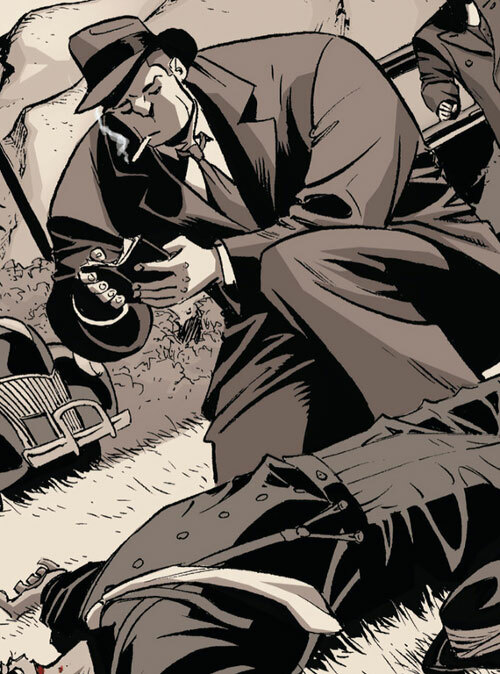 His time as sheriff has developed his perceptive abilities and made him a fairly good detective. Like all Fables, he is extremely long-lived, and is difficult to kill, allegedly based on the popularity of their tales. Once upon a time there was a prince who worried he’d never be sure someone loved him rather than his position. Confiding this in a witch who disliked princes, he found himself transformed into a beast and assured whoever loved him would have to love him for himself. Beast did find love, Beauty removing his curse and turning him human again. Except at such times as she grew angry with him, straining their love so that he reverted to his beastly appearance. He’d later learn that Beauty was not what she appeared. She was in fact the Lamia, who while fleeing from enemies met and killed a girl and took her appearance and life. The Lamia kept the form too long, and came to believe she was Beauty. But every so often Beauty reverts to Lamia — preceded by bouts of forgetfulness — and Beast must stop her preying on brutal men. She wakes after these periods with no memory of her actions. This problem was recently cured by the Lamia being killed during Goldilock‘s last murder spree, but Beauty surviving. When the Adversary’s empire reached their lands, Beauty and Beast joined the flood of refugees. They eventually ended up in the mundane world. Having lost or used most of their fortune in the journey, they were forced to take relatively low-paying jobs. He maintained the Fabletown buildings, and she worked in a bookshop. Their fortunes improved centuries later when Prince Charming became Mayor. With neither Snow nor Bigby willing to work alongside Charming, he offered their jobs to Beauty and Beast. To aid Beast in his job, the curse which controlled his transformation was modified so that he could control when the transformation occurred. 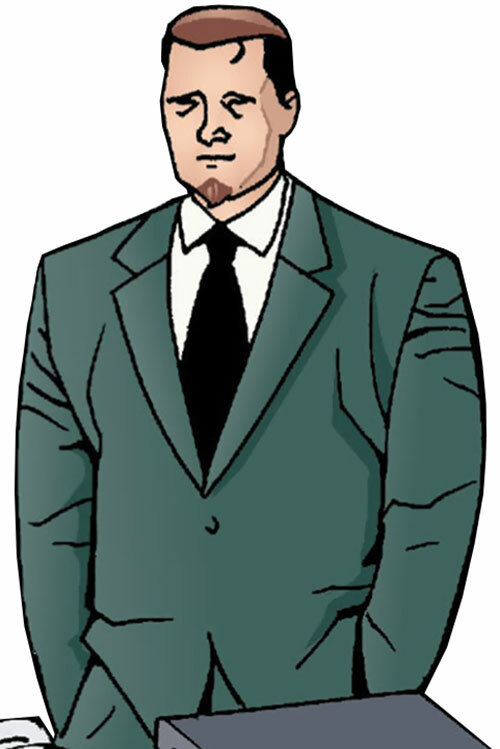 While initially overwhelmed by the responsibilities of his position, Beast grew into the role. When the Blue Fairy turned up seeking revenge on Geppetto for his crimes, Beast was duty-bound to protect the former adversary – who’d signed the compact. He convinced her to give him 777 days grace to get Geppetto to go with her willingly. When the 777 days were up, the Blue Fairy came to him again. He didn’t have Geppetto there, but explained that it was because he was acting as his agent in seeking a marriage arrangement with her. Since fairy engagement rituals can go on for years or centuries, this bought him time to actually come up with a plan. Whether the Blue Fairy’s murder by Goldilock affects this is unclear, since the Blue Fairy continued speaking after decapitation so may not actually be dead. Beauty and Beast have settled in King Ambrose’s kingdom of Haven — Beast becoming his sheriff — with their young daughter, Bliss. While Beast has realised he can no longer trigger his curse to transform, he and Beauty are unaware that it seems to have transferred to their daughter. Calm and polite, Beast is a much more conciliatory sheriff than Bigby. He reasons with people rather than browbeat them. If necessary, he’ll use force without hesitation, but he seems determined to avoid shedding blood. He prefers to avoid causing offence or upsetting people, wanting to show he’s not a monster. He even skirts close to breaking the law he’s supposed to enforce. 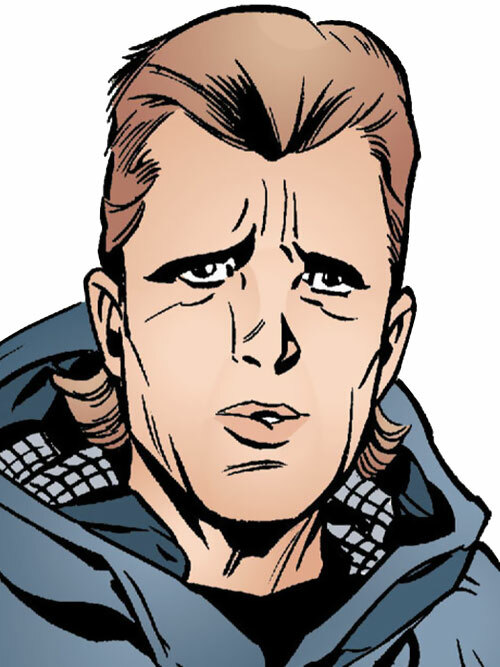 This caused him some problems when he first became sheriff, but he’s become firmer as he’s grown into the role. Near-Immortal, Special Credentials (Sheriff of Haven). Growth (Always on and already factored in): 02. 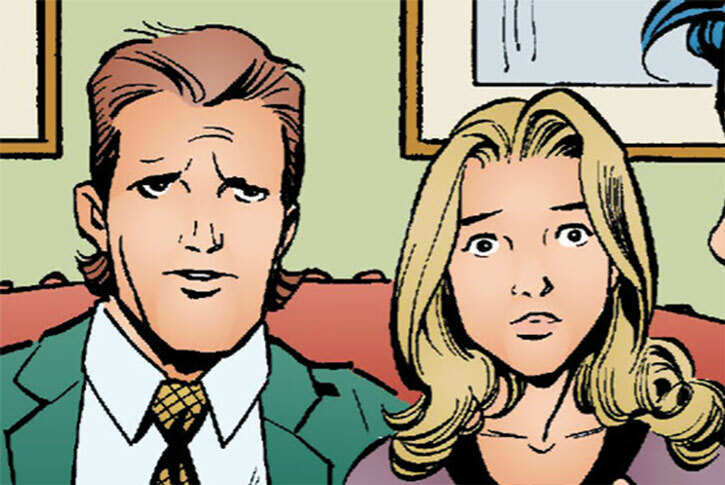 While Beast has been unable to change to his alternate form since the birth of his daughter, he’s had the Alter Ego form for centuries. Prior to becoming sheriff of Fabletown the Alter Ego was Uncontrollable, coming into effect whenever Beauty was angry with him. On becoming sheriff, the enchantment was modified by the Thirteenth Floor witches to better enable him to do his job, becoming Controllable. While uncontrollable, the transformation was scaled according to Beauty’s mood, so if she was just irritated with him his teeth might grow a bit and he’d begin sprouting horns. 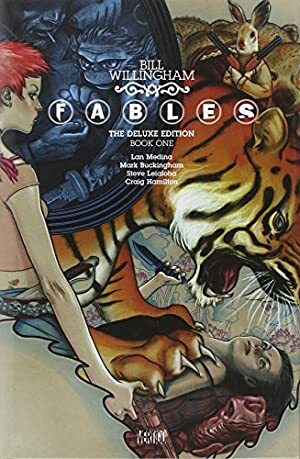 Source of Character: Fables (Vertigo, by Bill Willingham, up to #51).